Normandy is a region in France, a large country in western Europe. We will begin by looking at France's place in the world, and then work towards Normandy itself, which historically has been considered as one region, but today is divided into two administrative areas of France. France is a country in north-western Europe. It is a democratic republic. Flag of the Republic of France. It is part of the European Union. Its currency is the Euro (€). France has sea borders with the Atlantic Ocean and the English channel on its northern and western coasts, and the Mediterranean Sea along its southern coast. 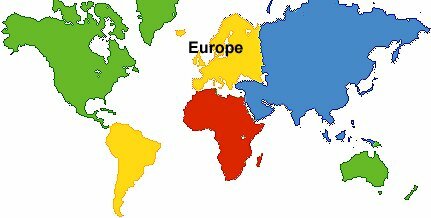 It has land borders with Belgium, Luxembourg, Germany, Switzerland, Italy, Monaco, Andorra and Spain. 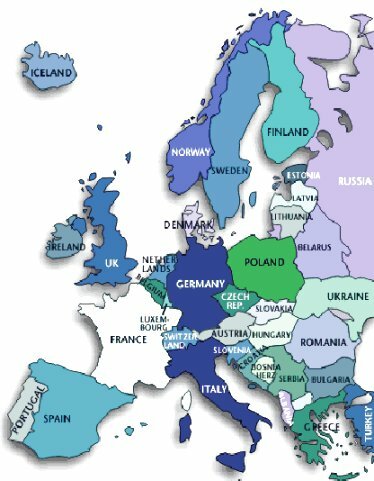 France is divided up into r�gions and d�partements in terms of its geography and government structures. The departements stem from the time of Napolean Bonaparte. The regions approximate to the ancient provinces that have come together to form the modern kingdom of France. The current structuring of the regions began in the 1950s, but formalised in its present state by the "Decentralisation Law" which was adopted in 1982. It was not until then that the term r�gion was officially used. There are 100 French d�partements, grouped into 22 metropolitan and four overseas r�gions. Metropolitan France consists of Continental France, that is, the territory on mainland Europe, together with the Mediterranean island of Corsica (Corse). In addition to Metropolitan France, there are French Overseas Territorities, divided into two categories, D�partments d'Outre-Mer (D.O.M) and Territoires d'Outre-Mer (T.O.M). On January 1st, 2006 the population of Metropolitan France was approximately 61,044,700, and that of the French Overseas Territories was approximately 2,543,000. The total area of Metropolitan France is 547,030 sq.km., which is 211,154 sq. mi. The total area of the Republic of France, which includes all its overseas territories is 674,843 sq.km., which is 260,558 sq. mi. Normandy is a large area in north-west France covering approximately 30,000 km² (11,500 square miles). This is almost the same size as the country of Belgium, which covers 30,500 km². The total population of Normandy is approximately 3.4 million (2005) compared with about 10.7 million for Belgium. Normandy is also about twice the size of the East of England region - the counties of Norfolk, Suffolk, Essex, Hertfordshire and Cambridgeshire - which together add up to about 17,300 km². To get an area of the UK approximately as large as Normandy, you would have to add Greater London and the counties of Surrey, West and East Sussex, and Kent to the counties of the East of England region. That is, Normandy is about the same size as the whole South-East of England. While historically Normandy consisted of a single region, today it is formed from two administrative r�gions - Haute-Normandie (i.e. Upper Normandy) and Basse-Normandie (i.e. Lower Normandy). Upper Normandy is made up of two d�partements - Seine Maritime and Eure. The regional capital is Rou�n, which is in Seine Maritime. The town of Le Havre, also in Seine-Maritime, is actually the largest town in Normandy, having a population estimated to be about 189,000 (2004), making it the fourth largest town in France. 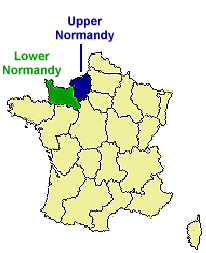 Lower Normandy is made up of three d�partements - Calvados, Manche and Orne. The regional capital is Caen. The regional flag of Normandy consists of two lions passant guardant (in heraldry these are known as leopards rather than lions). It is said to date back to the time of William the Conqueror. The English coat of arms is very similar, consisting of 3 lions rather than 2. It was introduced by Richard I in the 1190s, seemingly as an adaption of the coat of arms of the Duchy of Normandy.